Later this summer, Sony and Marvel Studios will team up on their second SPIDER-MAN standalone feature, this one subtitled FAR FROM HOME. No, that doesn’t reference where Spider-Man went after Thanos (Josh Brolin) snapped him into dust. 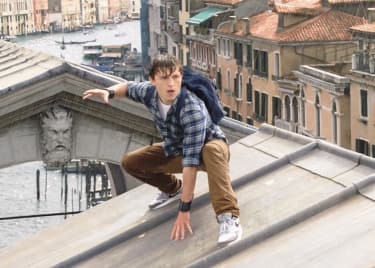 Instead, the movie will follow Peter Parker (Tom Holland) on a class trip to Europe with M.J. (Zendaya), Ned (Jacob Batalon) and the rest of his teenage cohorts. We have to start with the obvious fact. There’s absolutely no mention of AVENGERS: INFINITY WAR or the fact that Peter Parker turned to dust while fighting Thanos on Titan. Most Marvel fans assume that this will all be resolved in AVENGERS: ENDGAME, which opens at AMC in April. 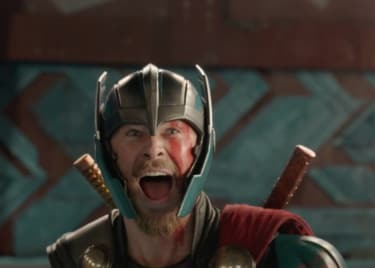 But it is a little strange for this trailer to just ignore the “Snappening” altogether. Oh well, on with the show! The biggest surprise in the SPIDER-MAN: FAR FROM HOME trailer is that Tony Stark (Robert Downey Jr.) no longer will be serving as Spidey’s MCU mentor. Instead, the teenage superhero will be lured into battle this time by Nick Fury (Samuel L. Jackson), who also dusted at the end of INFINITY WAR. Seriously, Marvel, you have some explaining to do! It’s noteworthy that when Fury approaches Peter Parker for the first time, he mentions that it’s “nice to finally meet you.” This, naturally, suggests that the two heroes do not meet up in AVENGERS: ENDGAME. Or, the events of ENDGAME somehow reset everything that happens in the MCU. There are still so many questions. We need answers! Here’s something that we can answer: Based on this trailer, and from information we have been able to pick up from previous interviews, Spider-Man will be fighting a series of villains known as Elementals in this new movie. One looks like Sandman. Another looks like Hydro-Man from the comics. These are C-level Spider-Man super-villains, who normally wouldn’t get a chance to carry their own Spidey movie. But we definitely see Nick Fury and Spider-Man battling them in key scenes in the film. The trailer saves its biggest reveal for last. Jake Gyllenhaal has been confirmed to play Mysterio in SPIDER-MAN: FAR FROM HOME, and initially, he’s being presented as a good guy. 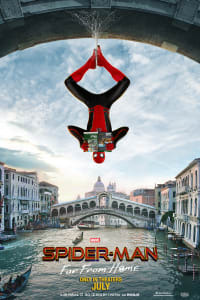 He appears during a scene where the water Elemental is attacking Peter Parker in Venice, and Mysterio swoops into action to stop Peter and his friends from being attacked. This is a huge switch from Mysterio’s origins in the Spider-Man comics. Mysterio was one of Spidey’s earliest villains and often used his special-effects illusions to create massive headaches for everyone’s favorite web-slinger. During a recent panel at Brazil Comic Con, Jake Gyllenhaal revealed that Mysterio and Spider-Man would share a “big brother/little brother” relationship in SPIDER-MAN: FAR FROM HOME and that the change to Mysterio’s origin is one thing that really appealed to him when considering the role. The rest of the SPIDER-MAN: FAR FROM HOME trailer rifles through some exciting shots that tease some new developments, but keep a few secrets until the movie’s July 5 release date. We can confirm that Happy Hogan (Jon Favreau) returns to Spider-Man’s universe, after serving as his colleague in SPIDER-MAN: HOMECOMING. Also, Happy seems to have a thing for Peter Parker’s Aunt May, once again played by Marisa Tomei. Also, we see in the trailer that Spider-Man will get not one, but two new suits. The first is the all-black Stealth Suit that the hero will use when on missions in Europe. And the second is a red-and-black outfit that Tom Holland showed off on Jimmy Kimmel’s show. We see Spidey wearing it as he swings into action near London’s Tower Bridge. So, SPIDER-MAN: FAR FROM HOME looks like a global adventure for our friendly, neighborhood Spider-Man. 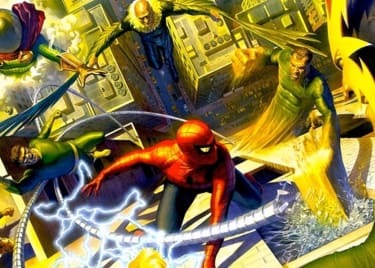 It will introduce the classic character of Mysterio, but also have Spidey team up with uber-spy Nick Fury, all while battling the terrifying Elementals. Got all of that? Good. Now make sure you circle July 5 on your calendar, because that’s when SPIDER-MAN: FAR FROM HOME swings into theatres. See you then!